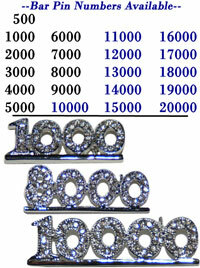 500 to 20000 Rhinestone Bar Pins. Celebrate milestones in business with these beautiful, sparkling rhinestone bar pins. Some in silver, some in gold and all gorgeous. $5.00 for 500 through 9000. $5.50 for 10000 through 20000.